Now that we have three kids, I’m more overwhelmed than ever. I honestly never thought I’d see the day that I was an overwhelmed mom. Before I had kids, I was full of energy and couldn’t wait to be this patient, Pinterest mom I’d always dreamed of. Instead, I felt like I was just surviving my days with the kids and counting the seconds until my husband got home. I started to really pay attention to the things that were causing me the most stress and tried to control what I could. Slowly, things started to click. I hope these strategies will work for you too! Feeling so overwhelmed by parenting was making me lose my patience and sometimes even my temper with my kids. I knew this wasn’t the parent that I wanted to be. So stressed with dropping the ball on things that I was forgetting to live in the here and now. I decided to start really keeping track of the things that we’re creating the most stress and helping me to feel completely out of control and to find ways to control what I could. in most cases this meant automating just about everything. One of the biggest things causing me stress was our finances. One of my most popular posts is about how we save money paying our bills every week. Right around the time I had our third baby we decided to switch banks. This meant stopping all of our automated payments and having to be organized enough to remember to pay things until I had the time to set everything up again. I always knew this system saved us a lot of money and helped stretch our paychecks when finances were tight, but I didn’t realize was how easily it could help save my sanity as a busy mom with three kids. When I tell you our finances got completely out of control after we brought the baby home I mean we got to the point that we were paying late fees for just about every bill and even got a shut-off notice for one of our utilities. It turns out they’ll threaten to turn your water off at just 10 days past due, but still. It was a problem. I guess we had gotten so used to having all of our bills being paid on autopilot that I was completely missing bills that needed to be paid. When you have kids, I can almost guarantee you don’t get enough sleep. Instead of constantly trying to do what you think is best for the kids, realize sometimes – you have to come first. For me, this looks like skipping nap time occasionally so I’m sure the kids will be exhausted at night. We’ve had some really weird nights where the whole family went to bed at 6:30 instead of our usual 10:30 or 11 bedtime for our toddlers. Every morning, write down just 3 things you need to accomplish today. This is usually phone calls, a load of laundry, picking up diapers, etc. The things you really HAVE to get done today – those are the 3 you write down. Then, jot down a few want-to-dos. I list about 7 every day. Honestly, I’m lucky if I get to half of those. Make it your priority to breeze through those top 3 items as soon as you can. Even if you’re letting your kids scream in the background while you make that doctor’s appointment. Just GET IT DONE. This way, you feel accomplished very early on. This motivates you to be your best self the rest of the day and eliminates that pressure you feel to do all the things at once. Believe it or not, a great night’s sleep starts first thing in the morning. Then, work to eliminate caffeine from your diet. Believe me, I want to punch myself in the face just saying this. If you really can’t sleep at night, caffeine has to be the first thing to go. Finally, keep a pad of paper and a pen next to your bed. When things pop into my head at night, I jot them down in that tablet. Yes, the lights are off and I can’t really see – but I can make out my chicken scratch in the morning. For now, the goal is to get it out of my head and onto the paper. Yep, sounds very new-agey, but the repetitiveness gets you into a more relaxed state so you can actually drift off to sleep. The thing no one told me when I started having kids was how hard it was going to be going from one baby to two. You assume the hardest transition is to just become a parent in the first place and in some ways – it is. For me, the most difficult transition, hands down, was when our second son was born. There was no more “nap when the baby naps” solutions to my sleeping problems. No more accomplishing the house work when one tiny person was distracted or asleep. Now, I had to juggle my days with two completely different personalities at different stages who needed different things. This (plus a lot of bad medical news for lots of our loved ones) is what plunged me into postpartum depression. 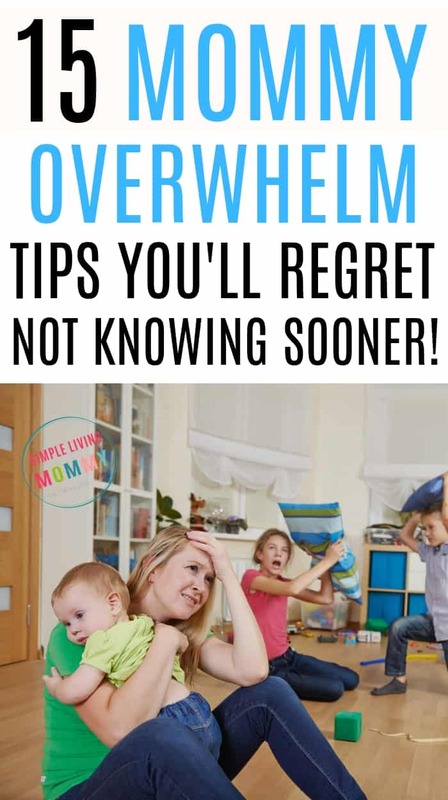 If you are feeling overwhelmed with a baby and toddler, take my advice, and listen to yourself before things start to spiral out of control. We can do lots of things to set up a routine you can count on, but at the end of the day, you need to listen to your own body and be honest with yourself and your spouse if you feel depression creeping in. Promise me before we go any further that you’ll talk to your doctor if you start feeling down? Promise? Okay, let’s move on. Find a good mommy group in your area and force yourself to get out of the house with both kids. Even if you’re joining a group of complete strangers and are more anxious than going on a first date. Just DO IT. This will exhaust your toddler AND your baby. If you live close to where these playdates are happening, this might mean a common nap time that you can use to your advantage. Either nap (I highly recommend this) or speed clean your home to take the pressure off later. Learn to use an instant pot to make meals all week. Make double batches and freeze half so you’ll always have a freezer meal on hand. I decided to find ways to have things think for me. My phone and its microphone option has been a lifesaver. Now I ask my phone to add things to my calendar and just double check that I got it right. I set up reminders for everything. Things I still have to do. Appointments I need to go to. Everything. The problem is I found that my mind goes a million miles an hour and I am constantly feeling like I need to look something up online or remember to pay a bill and I was on my phone constantly trying to keep up with all of these things I felt like I needed to do. I realized I was looking at my phone way more than I wanted to especially in front of my kids. Now if I think about something that I want to look up online or something that needs my attention I keep a master list in my phone and just tell my phone to add it to the list for me. This way, later on when I have some time, I can look up that movie I want to see or order a birthday gift I remembered I needed. I highly recommend this method when your mind is so all over the place that you’re dropping balls left and right. This Echo from Amazon is under $50 and is my next target for streamlining the mundane even more. Try it with me and let me know how it goes! My main takeaway from this experiment has been to automate everything possible you can focus on what’s really important. A perfect example of this is this blog. I write posts about things that have become a hiccup in my life in the hopes that someone else might read them and gain something from them. The problem is that even just finding the time to sit down and write about these things is next to impossible. I use Google Docs to dictate these articles for me and then I just go back through and clean them up later! It saves so much time and can be used for anything you need to write out as well. Most phones now also have a voice to text function, so you can use your phone to dictate things like simple emails, calendar reminders, etc. Another huge help lately has been my lazy meal planning method. Maybe you’re one of those people who can meal plan for weeks or even months at a time and never deviate from your meal plan. If so, please write to me and teach me your ways. In our house, we kept failing miserably at meal planning until I became way more relaxed with it. One of the main issues I have with cooking in general now that I’m holding a little one 90% of the time is doing simple tasks like cutting vegetables and measuring spices. A lot of our favorite meals involve a number of spices – some of our favorites are ancho lentil chili tacos and this super easy Tikka Masala. Now, when I have a few extra minutes and I’m near the kitchen, or the baby has some alone time in her seat, I measure the spices for these meals into plastic bags or mini mason jars, label them, and put them in our spice cabinet. Actually, sometimes whatever I have pre-measured determines what we’ll have for dinner that night. I pre-chop any veggies that I can and freeze them, then just grab them out of the freezer and add them to whatever recipe I’m making. Onions, carrots, and celery are PERFECT for this. Just about every recipe I make involves onions. It’s SO much easier to grab a couple of handfuls of already chopped and frozen onion to throw in a pan than to find time away from the kids to chop stinky onion. I’m already anticipating getting hate mail about not using fresh onions, but listen, it gets dinner on the table at a reasonable hour when my husband isn’t here to do it for me on late nights. It really helps in our house! Cut me some slack. It might help you too! Another big stressor for me was mealtimes – mainly breakfast. I don’t know if it’s just that I hadn’t had my coffee yet or that my family is just really wired and disagreeable in the morning, but by the time I was cleaning up from breakfast, my heart was racing and I wanted to just go back to bed and start over. Instead of trying to convince the kids to eat oatmeal or eggs in the morning, I give them cookies. I make breakfast cookies with whatever I have on hand. Usually some sort of dried fruit, a few mini chocolate chips per cookie, and oat flour. I use apple sauce instead of eggs and coconut oil instead of butter. Use mashed up bananas and a tiny bit of maple syrup instead of sugar and cookies for breakfast is actually a healthy option. My boys can dunk them in their almond milk and feel like they have the most awesome mom ever who gives them milk and cookies for breakfast all while I sit there and actually finish a cup of coffee. Simple lunches are another saving grace. I usually give fresh fruit, apples with peanut butter (or a *little* Nutella if they’ve been really awesome all morning), and chicken nuggets from Aldi. Getting out of the house. With three kids. I’d rather be a hermit and never leave our neighborhood. If I know we have somewhere to go the next day that requires we look halfway presentable, I’ll lay out the kids clothes the night before while I have my husband there to help…or while they’re sleeping. Diapers, everything. I’ll even lay out clothes for myself. Instead of putting things near the door where I may still forget them, I’ll go one step farther and actually put whatever I need to remember in the car. I always keep extra diapers and wipes in the car so if I happen to forget our diaper bag or something crazy like that, I don’t’ have to stress about it. This has happened more times than I care to admit. A key element in saving my sanity and preventing parenting overwhelm is having toys on hand that keep my toddlers attention while I tend to the baby or whatever housework I can get to. A HUGE hit in our house are off-brand magnet tiles. We couldn’t afford name brand Magna Tiles for both of our boys, so I went scouring Amazon and found this amazing set. It’s ¼ the price of the name brand toy for the same amount (or more!) tiles. Another huge hit in our house are these Amazon Fire Tablets. We do let our kids have screen time, but I try to really limit what screen time isn’t educational. Now, if I need to make a phone call or if they’re having a particularly hard day (or if we’re going on a long road trip!) I’ll set them up with ABC Mouse on their tablets and it seriously becomes like going from three kids to one. It’s amazing. At the end of the day, it’s so important that you do whatever you possibly can to eliminate day to day stress. Life is going to be stressful at times. Why not do absolutely everything you can to minimize what you can? 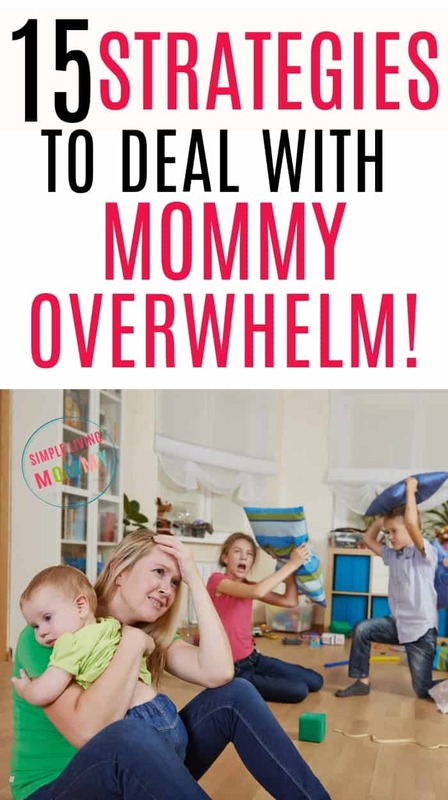 With less stress you can actually enjoy your kids while they’re still little, have the strength to not sweat the small stuff, and maybe even yell a whole lot less. What works in your house to eliminate some of the stress of parenting? 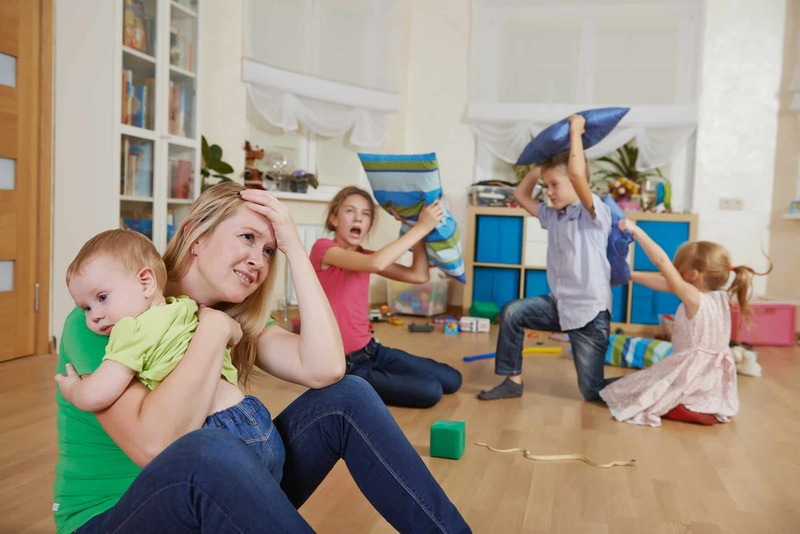 What are your most stressful parenting issues? Let me know in the comments! I really appreciate this article. Alot of articles i run into on pinterest blogs are more of a “martha stewart” crafts, schedules and diy projects that we are “supposed to be doing with our kids on a daily bases. Dont get me wrong i love all of that. But to me it is not realistic at all what a stay at home mom really gets to do during the day with kids. 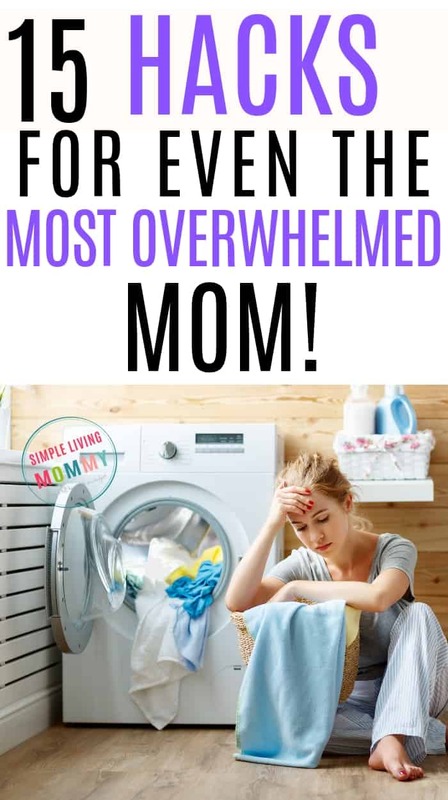 I have 3 as well, like you, and my youngest just turned 2 and i am in such desparity as to what i can possibly do diff to make things less stressful on a daily bases. Waiting for my husband to get home seems like forever. And like you, i avoid leaving my home with 3 kids alone unless my husband is here to help. When i had 1, or even 2 kids i meal planned and cleaned the house spotless everyday. With 3 its almost near impossible. Most days i have to just be satisfied with throwing a load of laundry in and bathing them and making a home cooked meal.